Synonyms: Oregairu OVA, My youth romantic comedy is wrong as I expected. 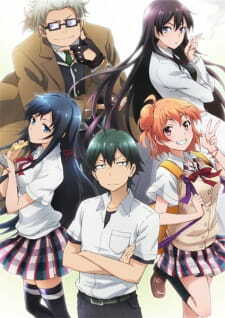 OVA, My Teen Romantic Comedy SNAFU OVA, Yahari Ore no Seishun Love Comedy wa Machigatteiru. : Kochira Toshite mo Karera Kanojora no Yukusue ni Sachiookaran Koto wo Negawazaru wo Enai. The OVA adapts novel 7.5 of Wataru Watari's light novel series of the same title. Parent story: Yahari Ore no Seishun Love Comedy wa Machigatteiru. It's been roughly a year since I finished the TV version and with the announcement of a second season I immediately craved more. And then it happened, I found out an OVA existed, which I just recently had the pleasure of watching! The story has nothing to do with the TV version, it's just a side story. The story wasn't anything special but the comedy is what carried the OVA, It's top notch, perhaps even surpassing the TV serie's comedy. Basicly Hiratsuka-Sensei (Their teacher) has to write about marriage and asks the Volunteer Servie club after help since she's hopeless when it comes to marriage, they agree, naturally. So they spend an entire day in the club room coming up with and later doing those hilarious ideas. There are a lot of funny and memorable moments throughout the OVA - Such as Hachi's obsession with Totsuka Saika (The trap) or the usual genius dialogues between Hachiman and Yukino. You know, the good 'ol stuff. there's not really much to complain about the characters, It's the usual gang - Hachi moping about how boring life is, cold-hearted Yukino with her facts, and the cute trap for the fan-service of course. So there's not really any character development present, just fan service! The art and sound? Almost identical to the TV version. they really didn't hold back on the production value considering it's only an OVA. So If you want a relief episode that surely will bring laughter and a big smile to your face, then I can guarantee that this won't dissapoint you. If you watched the series before the OVA, the characters are the same and just as entertaining. If you haven't watched the series this is definitely a fan service OVA than something that can be watched as an introduction to the series. Marriage is weird isn't it? You basically devote the rest of your life to one person and if it all goes okay you don't die alone. The OVA attempts to address marriage in a way we young'uns can understand. The story is nothing special. The service club is commissioned to fill the space of a magazine that will advertise the town as a hotspot for weddings and make marriage more appealing to younger people. To do this they send out a survey to their class and find that the overall idea of marriage among high school students is lacking. They attempt to gain a better understanding of marriage by asking Komachi because she takes care of Hikigaya. She issues a series of "marriage challenges" that all of the characters participate in. This includes cooking, trivia and wearing a bridal gown, all of which were fun to watch. The art and sound was standard to the series, and the dialogue made me laugh a lot even though it was pretty much the same as the series. What irked me was the sexist portrayal of marriage. The writers seemed to paint a picture of marriage as something where the majority of the work is done by women for the men and none of that should be questioned. The trivia section made this extremely evident because the questions posed were how to be the perfect housewife. While everyone (including Hikigaya) gave varied and valid answers, all of them were shot down and replaced with Komachi's ideal answer. What I got from it is that there is a specific way wives are supposed to treat their husbands and their family. In this way the writers have restricted what marriage really is and replaced it with a sexist ideal. Maybe I shouldn't take it so seriously, but in a series with strong female characters I expected more than this. Watch it because it's entertaining. However, be wary and treat your SO equally. If you are a fan of Yahari Ore no Seishun Love Comedy wa Machigatteiru season 1, then watch this OVA for some light fanservice. It is non-canon and features many popular characters from the series. The point of this OVA was likely a response to fan mail post season 1. It also serves as a teaser for season two without spoiling any story points as its non-canon. Story - The service club must help Shizuka Hiratsuka with a wedding magazine request. This allows you to see all your favorite female characters and side characters dress up. The story doesn't matter since its non-canon but it does setup a harem-esque ending. For fans of this anime, most people should welcome this OVA as a way to satiate their appetites. Yet I was hoping that there would be more in this OVA than a throwaway episode. Characters - All the characters act just like they do in season 1. Part of the charm in this anime is that some characters are less superficial and more developed compared to other anime. Expect all the hijinks you would in this light fanservice OVA. Unlike the anime series, you will not find the philosophical monologues from the MC. The bottom line is that if you are a fan, you should watch this. The reason why I rated it average is because many other anime have done a lot more with OVAs than what we get here. The possibilities are endless. We could have seen more of other characters that get less screen time. The other factors are that it was used to promote/hype the second season. So I also see it was a marketing gimmick as well as a way to respond to fans of the show. Brain Base had an excellent opportunity to do more here but instead what we get is almost a throwaway OVA in retrospect.